On January 26th, this screen shot ended up on ESPN.com. 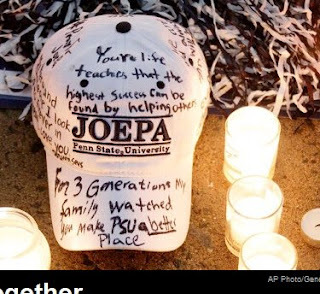 It was a heartfelt gesture from a community that truly did lose someone important to them. It's also a very fitting unintentional metaphor we can think of: covering up the mistake made in permanent marker; it's still there, you don't have to look too hard and it isn't going away. We don't plan on writing about recruit chasing, anything but the actual game when the hoops team makes it there in November or the future of new college hockey programs. Let them be buried and consider this our only shovel of dirt.